CD205, previously known as DEC-205, is a C-type lectin that belongs to the family of macrophage mannose receptors (MMR). In humans, it is highly expressed on myeloid blood dendritic cells (DC) and monocytes; at medium levels on B cells and low levels on NK cells, plasmatoid DC and T cells. Cortical epithelial cells also express CD205. Mice have a narrower CD205 expression profile on leukocytes. Furthermore, expression is higher on mature DC; having carried out an endocytic function on immature DC. While the precise ligand for CD205 has not been defined yet, it has been established that it is a receptor for dying cells, a function that may be important in thymic and peripheral tolerance. Antibodies to human CD205 (MCA2258, clone MG38) are produced by Bio-Rad in a range of formats including FITC and RPE for flow cytometry. Purified and low endotoxin versions of clone MG34 are additionally suitable for immunoprecipitation and staining frozen histology sections. Anti mouse CD205 (MCA949, clone NLDC-145) has not only been conjugated to the traditional flow label FITC but also the higher performance Alexa Fluor® 488, Alexa Fluor ® 647, and Alexa Fluor ® 700. 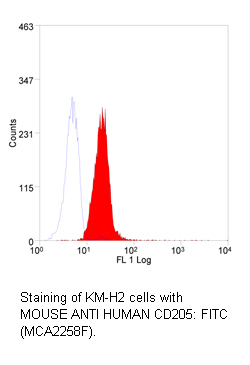 Clone NLDC-145 in supernatant form can be used for staining frozen sections. In addition to anti human and mouse CD205, Bio-Rad offers bovine specific CD205 (MCA1651, clone CC98). FITC labelled antibody is available for flow work. For immunoprecipitation and staining frozen sections a purified version is available. Anti-CD205 antibodies produced by clone CC98 are also able to reveal CD205 on sheep leukocytes. Below is a full filterable list of the CD205 antibodies that we stock within our range. If you cannot find what you are looking for please do not hesitate to get in touch. Shrimpton RE et al. (2009) CD205 (DEC-205): A recognition receptor for apoptotic and necrotic self. Myra Small and Georg Kraal (2003) In vitro evidence for participation of DEC-205 expressed by thymic cortical epithelial cells in clearance of apoptotic thymocytes. Bozzacco L et al. (2007) DEC-205 receptor on dendritic cells mediates presentation of HIV gag protein to CD8+ T cells in a spectrum of human MHC I haplotypes. Butler M (2007) Altered expression and endocytic function of CD205 in human dendritic cells, and detection of a CD205-DCL-1 fusion protein upon dendritic cell maturation. Pack M (2008) DEC-205/CD205+ dendritic cells are abundant in the white pulp of the human spleen, including the border region between the red and white pulp.